Event Overview: The 3rd International Conference on CRE provided an opportunity to engage in interdisciplinary collaboration and research on issues related to the development of infrastructure in CRE and justice initiatives. Presentations representing work in 17 states and 10 countries focused on innovations in the fields that are making broad impacts in local, state, national, and international communities. More than 300 participants (drawn from the local, state, national, and international community) exchanged best practices, evaluation methodology, creation of policy implementation structures, consideration of obstacles to success, and new and innovative use of training, resources and technology. On-site events included a meeting of Community Colleges developing peace and conflict studies programs in partnership with the United States Institute of Peace, and a networking meeting for Ohio Colleges and Universities with Peace and Conflict Studies Programs, Centers, Certificates, or Degrees. The Global Issues Resource Center and Library at Cuyahoga Community College partnered with colleges and universities, and local, national, and international non-governmental and governmental organizations to host the conference, building upon the Inter-American Summit on CRE 2007, the International Summit on CRE, Youth and Conflict: Global Challenges – Local Strategies 2008, and the policy meeting Collaboration across Fields: Implementation and Sustainability of SEL, CRE, Peace Education (PE), and Citizenship Education (CE) 2009. 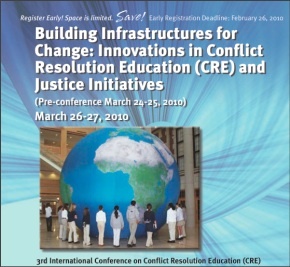 These earlier conferences and meetings brought together government representatives from among the 50 states, around the globe, and their non-governmental organization partners who have legislation or policies in place to deliver CRE/SEL/PE and Civics Education at the K-12 level and in universities.